I’m feeling excited this morning because I have two new storage units being delivered today for my studio. I decided it was about time I re-organised the area on the units behind where I sit! The courier company the supplier is using, Interlink Express, has given me a one hour time slot for my delivery. This is extremely unusual for us here in the UK – we normally get told which day a delivery is going to be but then that’s it. This is fantastic help for me today as I have two videos to make and it’ll be so easy to work around this time slot – a big thank you goes out to Interlink Express! When I first saw the Grateful Bunch Stamp Set when I was at OnStage Live in Brussels, last November, I knew I had to have it! 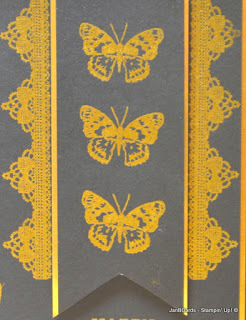 I absolutely love the strip of lace stamp and I could see it heat embossed! I knew with the quality of Stampin’ Up! stamps, the detail on this stamp was going to be brilliant…………. which it is! Yesterday, I made the Crumb Cake card first which then led onto the Basic Black card. I started the Crumb Cake card with a base of Crumb Cake Cardstock followed by a layer of Whisper White and a top layer of Crumb Cake. 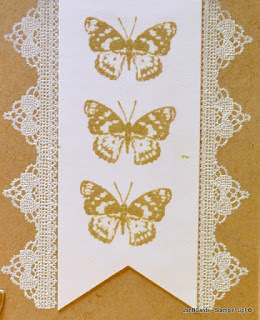 I did the lace stamp first and heat embossed it in White Embossing Powder. Then I did the Whisper White tag using the butterfly stamp in Crumb Cake Ink and painted over them with the clear Wink of Stella Glitter Pen. 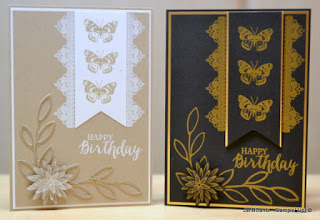 The sentiment, which is from the Rose Wonder Stamp set was also heat embossed using White Embossing Powder, albeit slightly crooked! I played around with a few ideas for the decoration in the bottom left hand corner. I wanted to use the dotted leaf stamp in the Grateful Bunch Stamp Set but found it was too long. Eventually, I settled on stamping the leaf design from Rose Wonder Stamp Set in Crumb Cake Ink onto Crumb Cake Cardstock. I then die cut it using the die from the Rose Garden Framelit Dies. 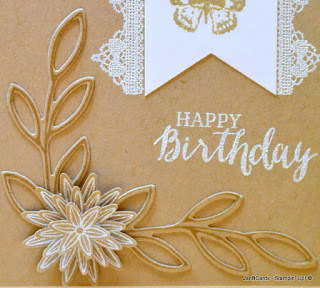 I heat embossed the three flowers from the Grateful Bunch Stamp Set and punched them out using the Blossom Bunch Punch. 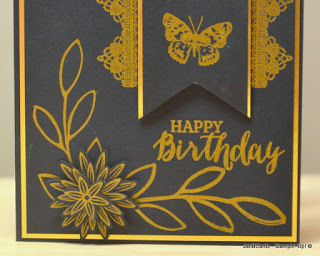 Once the card was finished, I just had to make one in Basic Black and Gold! Hopefully, this will be one of today’s video and ready for posting on Sunday! 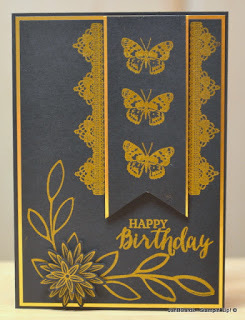 One of the changes I made was to mount the butterfly “tag” onto some Gold Foil and adhere to the card using Dimensionals. I also stamped the leaves image and heat embossed them directly onto the cardstock rather than onto a scrap Basic Black Cardstock and die cutting. I think that’s about it from me today, so until tomorrow, happy crafting.